Lake Effect's Bonnie North and Tom May interview Les Paul, musician and inventor. Many of the technologies that are used today in the music and broadcast industries can be traced back to Waukesha native Les Paul, musician and inventor. 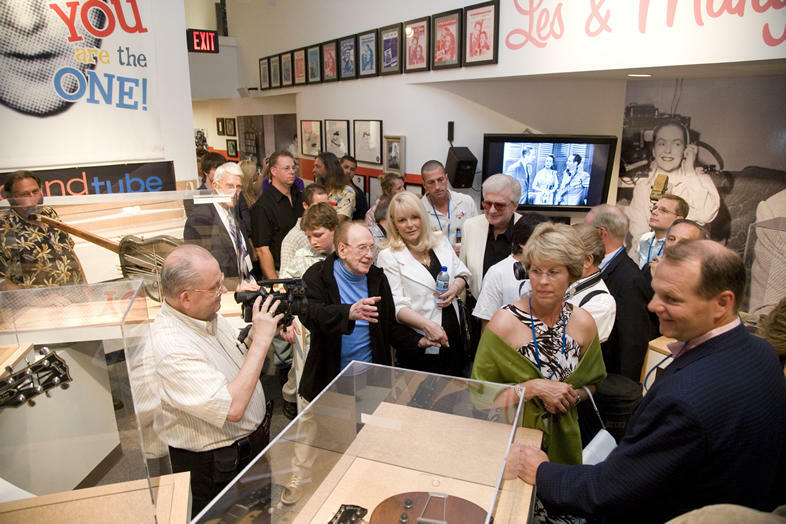 Lake Effect's Bonnie North and Tom May got the chance to meet with Paul at Discovery World's newly opened exhibit "Les Paul's House of Sound." 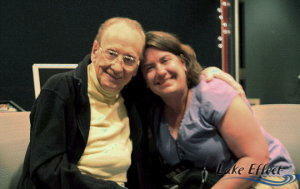 Les Paul with Lake Effect's Bonnie North at the Les Paul's House of Sound at Discovery World. "I was always interested in these things I hadn't figured out yet," says Paul, "Being born new, there are many things that I'd say 'What's that?'" Born and raised in Waukesha, he started his music and inventing career in Milwaukee. He recalls going out to TMJ to stand under the transmitter, analyzing the sounds and the effect the environment had on the technology. Paul notes "Teachers would say 'This guy is something else! He asks a lot of weird questions!'" In order to answer those "weird questions," he spent a lot of time reading and researching at the public library. His first invention came out of Sears and Roebuck's Harmonica Rock, which was meant to lock it to the player's chest and they can play the harmonica with the guitar. He found that the gizmo was not enough for him; he wanted to play two harmonicas and the guitar at the same time. By drilling holes and connecting the harmonicas with a coat hanger, he was then able to play in four different keys at the same time. This was his "first really super" invention. "Accidents are terribly important," says Paul, "You don't realize it's an accident...You got there." Les Paul at Les Paul's House of Sound exhibit at Discovery World. Most of the instruments and technologies he uses were accidents, even though he won't turn the machine on before he knows what he wanted. Therefore, most of the inventions turned out even better than expected. His best known "accident" was overdubbing, the ability to record and perform with multiple tracks at the same time. Tom May noted that this took stereo a step further; stereo means using two channels, but Paul overdubbing used more than that. It allows for a lot of flexibility in editing and to use different sounds that can be mixed later. Paul says that overdubbing happened one night when his bass player and guitarist left and he was all alone. He was dying to play one more song, "Lime House Blues." He laid out his fold-out bed and his homemade recording gear and recorded the grooves of the bass and recorded another set of grooves that he could play along to. After playing around with this technology, he made a joke Christmas present for Capitol Records by recording two songs on the same side of the CD. This joke present increased his fame; the two songs were "How High the Moon" and "Waiting for the Sunrise." "That's why I believe in this 'Les Paul's House of Sound,' because you have to be careful when you teach the fellow if it is in the electronics or if it is in the music." "The secret is not to play something else, but to play something better than what the guy wrote. Otherwise, don't go there." "When I have a guest come up, he is the picture and I am the frame. It is my job to make him look better."